The other day my company put on a day of presentations for our customers to celebrate our 10th anniversary. As one of the technology demos we showed off one of the new web-connected printers from HP. One thing we didn’t care for was the crazy HP ePrint email address. If we wanted to make it easy for our customers to try printing from their mobile devices we couldn’t very well make them type in <string of random chars>@hpeprint.com all the time. 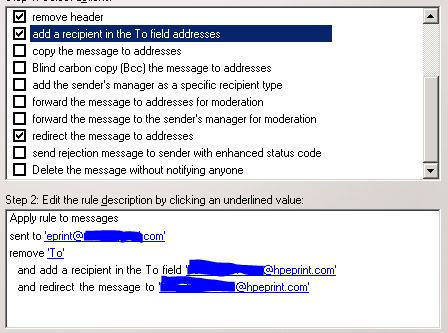 So we decided that we’d just create a mailbox rule on our Exchange 2010 server that would forward the message to the ePrint email address generated by HP. This didn’t work at all. Due to what are probably sensible anti-spam precautions the messages were rejected. I suspect that when the message headers were analyzed the didn’t pass muster bouncing through another mailbox like that. I thought about it and decided this may be a place to try using Exchange Transport Rules. We kept the Exchange mailbox, eprint@<domain>.com. This may or may not not be strictly necessary but given the fact that our spam filtering service gets the list of accepted email addresses from Active Directory we did need it in our case. In the Exchange Management Console I went to Hub Transport under Organization Configuration. From there I went to the Transport Rules tab and I created a new rule. In Step 1 I checked the “sent to people” box and entered the value eprint@<domain>.com address. I wanted to make sure that rule was only applied to messages I intended to print. In Step 2 I checked the “remove header” box and set it to remove the “To” header. I also checked the “add a recipient to the To field addresses” and the “redirect the messages to addresses” box and entered the ePrint email address as the value in both of those fields. I didn’t enter any exceptions in the last window of the wizard. At this point I sent a test message to the new address and the message printed perfectly. It simplified things for the customers at our tech fair and they were able to very easily test what seems to be a very desirable printing feature for many of them. Very nice. I will have to try this. I was playing with this last night and ran into the exact same thing. Since I started late and using an exchange contact failed, I called it a day. Poking around today, I found your post. I will give it a shot in the next few hours. Awesome. I hope that it helps you out.